In the minds of a great many people who train with weights, the deadlift is the exclusive domain of powerlifters. Few people include it in their programs, even if they’re primarily interested in gaining size and strength. In many gyms the deadlift is considered dangerous and not allowed. Then, of course, there’s the group that avoid it for a more basic reason – it’s taxing. In fact, the deadlift is one of the very best core exercises in all of weight training, and it belongs in everyone’s routine, even trainees who aren’t interested in building great strength. What makes the deadlift so beneficial is that it involves so many large muscle groups – and since you can use a good deal of weight, it strengthens all he groups rather nicely. Even if you have only a moderate amount of weight on the bar, deadlifts bring into play all the muscles of the back, hips and legs as well as the shoulder girdle. If you doubt that the arms and shoulders are involved, try doing deadlifts when those areas are injured. You simply can’t. Like the full squat, he deadlift is a total exercise that forces you to reach deep into your reserves, and reaching deep helps increase strength. 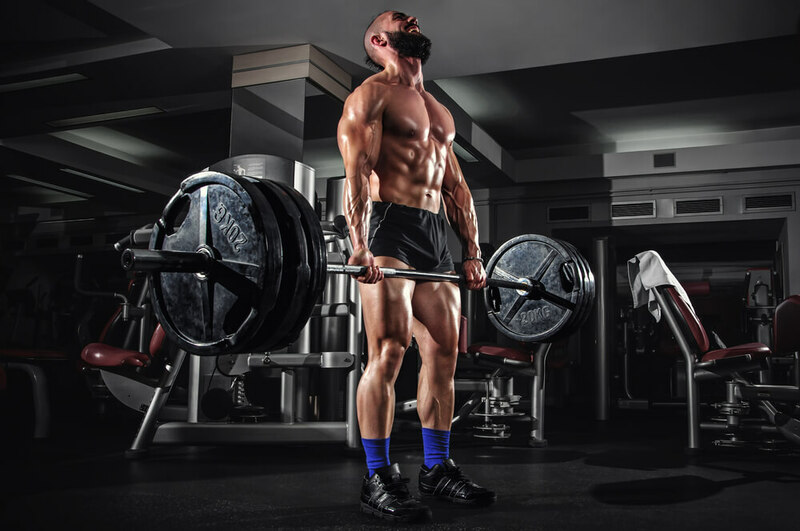 The deadlift is a basic movement used by everyone in all walks of life. A housewife needs to know how to pick up a heavy object off the floor. That’s the reason I teach all beginners to do deadlifts: youngsters, female athletes and fledgling strongman. The deadlift is a good basic exercise for another reason. Once you learn correct form on it, you’ll find it much easier to pick up the form points on other pulling movements, such as the power clean and high pull. I’ve received many letters from readers who agree that the squat is the single best exercise for gaining size and strength but aren’t able to do it. More often than not it’s because of a shoulder injury that makes it impossible for them to fix the bar on their back. They want to know what exercise they can do to help maintain the hip and back strength. There are lots of misconceptions about this exercise. Many believe that in order for it to be useful, you have to use very heavy weights. That isn’t true. The deadlift can help enhance overall strength even if you only use moderate weights. You just have to do fairly high reps. It’s also an excellent rehab exercise. I’ve had people rebuild their injured backs by doing deadlifts with only the Olympic bar. The movement is often categorized as being dangerous or at least high risk. If you use faulty form, yes, it can be risky, but that’s true of any exercise. The one consideration about its danger factor is that injuries incurred when people are deadlifting are often severe. That’s because you can usually handle more weight than on any other exercise. Trainees who hurt themselves on deadlifts are trying to lift too much weight too soon. They haven’t established a base to max out with a heavy single attempt. That’s often the case with youngsters who’ve been left unsupervised. It also happens to those who don’t take the time to perfect their form. If you maintain correct technique, you may not complete a max attempt, but you won’t hurt yourself. It really is a simple exercise. You grip the bar and stand up with it. Because it’s so simple, however, many don’t pay close enough attention to the small points of form. Here’s a short course in deadlift technique. I’ll start with foot stance. Your feet should be shoulder width apart or a bit closer. The best way to determine your ideal foot placement is to shut your eyes and imagine that you’re about to do a standing broad jump. You’ll find that you set your feet somewhere closer than shoulder width and your toes will be straight ahead. Your grip should also be shoulder width. I teach everyone the same basic grip. Extend your thumb until you can barely tough the smooth center of the bar. Some find they do better using a slightly wider or narrower grip than that, but it’s still the best way to teach a beginner. On the subject of gripping the bar, the question of using a reverse grip comes up. A reverse grip is one hand over the bar and one hand under, and I discourage beginners from using it. I much prefer them to use straps when the weight gets too heavy for them to hold the bar properly. The reverse grip places an uneven stress on your back – not a great deal, but it’s often enough to cause problems for a beginner. The movement is much smoother without the reverse grip, and if you’re doing deadlifts to help with the two Olympic lifts, the overhand grip is absolutely necessary. More advanced lifters can use the overhand grip with a hook, which locks the bar as tightly as if you were using straps. Many powerlifters argue that using the overhand grip with a hook isn’t as effective as the over-and-under method. I remind them that the great Bob Peoples used the overhand grip with a hook when he deadlifted 700 pounds. That was in 1947, and the Johnson City, Tennessee, native weighed less than the Light Heavyweight class limit. Beginners really don’t have to be concerned about using a reverse grip or even straps for some time. You shouldn’t be handling that much weight at that stage. A key point for anyone starting out on this lift is to proceed slowly. Since so many large and small muscles are involved in the movement, you have to spend time making certain that they’re all sufficiently strong early on. Sometimes even a little is too much early on. I’ve seen lifters handle 325x5 perfectly, then add 20 pounds to the bar and watch their form break down completely. Set your feet, grip the bar and move in close to the bar – very close. Your shins should be against the bar. Now for your body position. First and foremost, your back must be flat and tight. The best way to do that is to pull your shoulder blades together and hold them in that locked position throughout the lift. If you fix your upper back, it’s much easier to keep your middle- and lower-back areas taut as well. You don’t want your back to round at all. Later on, when you’ve built a solid base, that’s all right and even desirable in some instances – but not during the learning stages. If you find that you’re rounding your lower back, lower the weight. It’s better to do 275x5 with perfect form than it is to use 300 and resort to sloppy technique. You can still increase or maintain your workload simply by adding a few extra sets with that lighter poundage. Form should take precedence over numbers. Learn correct technique and the numbers will take care of themselves. Another key form point is to make sure your front deltoids are in front of the bar – at the start, in the middle and at the finish. Once you’ve completed the lift, it’s all right to lie back a bit, but don’t exaggerate the backward lean. It puts your lower back in an unnatural position. Many lifters do it because they’ve seen powerlifters do it, but powerlifters do it to show the judges they’ve finished the lift. Many lifters are confused about hip position. They believe the hips must be set very low. That’s not true in every case. Your starting hip position depends to a large extent on your body type. Short, chunky individuals usually do well with their hips set low, but taller lifters benefit from a starting position where their hips are rather high, even parallel to the floor. A high hip position is fine – if you can hold it. If, however, you allow your hips to rise when the bar breaks the floor, it’s not good. Whatever starting position you use, you have to hold your back flat and keep it flat. Look forward or slightly upward, but not too much. Straighten your arms and keep them that way during the lift. They’re merely connecting links. Think of them as chains. You’re all set to commence the lift. Every muscle in your body is tight and ready. Now, instead of pulling the bar, think of pushing your feet down through the floor. The bar will move upward in a smooth line. That’s not always what happens, of course. That would be an ideal world. Most lifters make some type of form mistake. The most common is that they allow the bar to float away from their bodies too much, either while lifting it or while lowering it back to the floor. You have to keep the bar close all the time. It has to brush your shins, knees and thighs as it goes up and also as it comes down. The bar will always want to run forward. That’s the reason you must keep your back extremely tight. If you relax any part of your back, the bar will float away, which adversely affects leverage. In many instances lifters elevate the bar correctly but fail to pay attention to keeping it close to their body when they place it back on the floor. It’s a truism in weightlifting that can injure yourself when lowering a weight incorrectly just as easily as you can when lifting it incorrectly. Some people tend to round their backs when lowering the weight, mostly because they’re not paying attention. When you lower the bar away from your body, it’s usually too far away from your legs at the start of the next rep.
Lower the weight in a controlled manner, keeping it fairly close, just as your did on the way up. Set the plates on the floor, then pause a moment in order to reset your hips and back before starting the next rep. Don’t rush your reps. If you do, you’ll most likely break form. It’s also an easy habit to start rebounding the plates off the floor, especially if you’re using rubber bumpers. It may seem like a neat trick because it makes it easier to set the bar in motion, but it’s self-defeating. You bypass a critical part of the exercise, the start. The cheating will always catch up with you because you can’t rebound the first rep of a max weight. In my experience trainees who have been taught to rebound have had trouble breaking the habit. in extreme cases I have them do a rep, release the bar, stand erect, then do the next rep. I also prescribe that for anyone who has difficulty holding the correct body position for the start of the lift. The entire movement should be smooth and controlled; more slow than fast – and no herky-jerking hitching, even if the bar sticks along the way. Learn to lock your body tightly and keep pressure on the bar, and it will slowly inch upward. Eventually, once you’ve mastered the technique, you can explode the bar off the floor and move it upward rapidly. In the beginning, though, slower is better because it will help you stay in the right groove. One thing I like beginners to learn early on is to contract their traps as soon as the bar passes midthigh, rather than waiting until they’re fully erect and the bar is stuck. That almost always results in a hitching, jerky motion to complete the lift. If, however, you start using your traps early in the movement, when the bar passes midthigh, the finish comes easy. Once your traps have elevated the bar, it’s quite simple to bring your hips forward. You can breathe at the completion of the lift and when you reset the bar back on the floor, but hold your breath while the bar is in motion. The reasoning behind that is the same as for any strength lift. Holding your breath helps you lock your diaphragm, which creates a positive intrathoracic pressure. If you breathe during the exertion, your diaphragm and rib cage must relax, which diminishes your power base. A rep only takes a second or two, so there’s really no danger of running out of oxygen. While you’re learning the proper form on the deadlift, stay with 5 reps. I know that many recommend 10’s and 15’s for beginners on any exercise, but I’ve found that higher reps promote form breakdowns because the muscles being used in the lift have not yet developed enough. Technique deteriorates as you get tired. I find it more prudent to stay with moderate reps so you can always maintain perfect form. If you want to do more work, add a few more sets. If you aren’t doing squats, doing deadlifts twice a week is fine, but you should still only work them heavy once a week. After you’ve been deadlifting for some time and have moved your numbers to a high level, you can do deadlift every two weeks. That helps to keep you from going stale on the exercise. Prior to doing any deadlifts, even with light weights, you should do some ab work and an exercise for your lower back. A set of situps or leg raises and a set of hyperextensions or reverse hypers help prepare your body for the work ahead and can greatly lower your risk of injury. In my next article I’ll show how you can build variety into a deadlift routine and show you some ways to improve on this strength exercise.